In the weeks prior to going on this Bonsai trip I had waited a year to go backpacking with Mike and Gary for Golden Trout. Unfortunately my boss put the kibosh on my vacation this year and my time was limited. As the time neared for my Golden Trout adventure and knowing my trip was off my mind started working overtime, awake or sleep to try and make something happen. I came across an opportunity to go somewhere in the wild; far, far away from everything. I had only 3 days so I did not want to spend too much time driving; hence the bonsai, nature of my trip. The most I could spend hiking was 1 day in so I needed a place close by within 4-5 hundred miles and no more than a 10 or 12 mile hike. I had never been to this location so it was a real gamble. 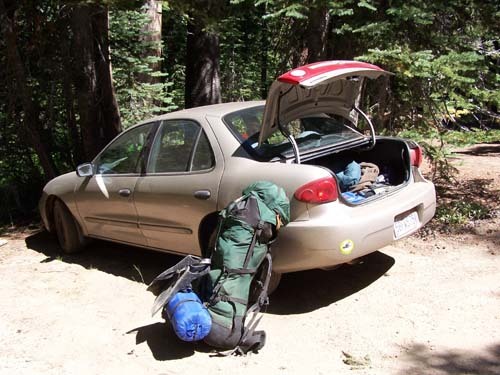 To those of you who have backpacked in to alpine lakes with me will know I really don’t pack light. I have learned that some of these lakes have trees surrounding the water line and many times all you can do is roll cast. It’s a challenge just to find structure in the water where fish hide, standing on the shore your visibility is limited due to the glare on the water hiding the surface below. It was not too hard finding this trailhead on a forestry map but knowing if it was the right one was just a guess. In fact if it weren’t for a topo map and my GPS finding the trailhead would have taken me longer. There’s about 2-4 miles of bad road IE. forestry road with signs that have been crashed and on the floor, roads that I witnessed wimps in their 4X4s not wanting to traverse and turning around but a fly fisherman like myself driving a little battle scarred car with front wheel drive and much determination made it through. This lake is just too close and too good and like most places gets way too much fishing pressure. Luckily the trout are wild and eat flies. They really don’t just bite anything that comes along at least they didn’t at this time of the year. Maybe at ice out they would be hungrier? The lake is in a volcanic caldera and the water is warmer than the air temperature some times by as much as 20 degrees. The water is clearer in the early morning and late evening. It has a green tinge in the daylight hours and bugs were hatching mid afternoon while I was fishing the lake. I’m still trying to identify some of the bugs that were hatching. Some looked like small cadis hatching but they were on the surface briefly due to the wind and some were probably blown in. As I do normally when I go to a new lake I fish the entire lake looking for submerged boulders or logs, inlets, springs etc, etc. I am trying to be more observant as to what insect life is hatching and what is rising. On this particular trip it was so windy that I did not see any rises. I thought I heard fish jumping sometimes but the wind would cover their tracks immediately. It was not a normal wind. There were micro bursts of wind that would hit the water and blow water on top of me. I didn’t have this sort experience before and it made float tubing the lake more challenging. You actually need to time your casts’ in-between these micro bursts of wind! Insects would rise and float on the water mid day but they were scarce. I had much better luck with emergers. Also the fish were finicky, which is a good thing. 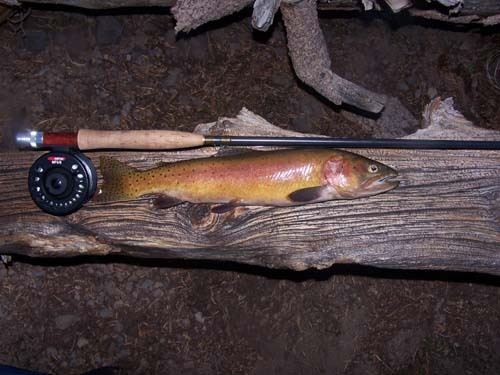 The trout needed to see the right size and color bug before they would bite and then the takes were not real strong. Mostly they were sipping these emergers or at least following them for some time. Once hooked, even the smaller fish fought valiantly; the fight of a wild fish is second to none. Once I had found a spot that was producing and a bug that worked I suddenly got a great strike that I almost thought was a rock. I played tug of war with this king of the lake for what seemed like an eternity. When I saw his bright gold color and he saw me it spiked both our determinations. He pulled one way and I pulled the other. He took another run and I was praying my leader would hold up to this tug of war. This gorgeous golden giant I wanted to land badly. I kept the tension on and played him nicely. In the back of my mind thoughts ran through that he would either snap the line, leap and snap the line or take a huge run and then break me off but he didn’t. It was Just a steady fight this fish taking me for a ride at times in my float tube. I finally got him close enough and guided him into my net. 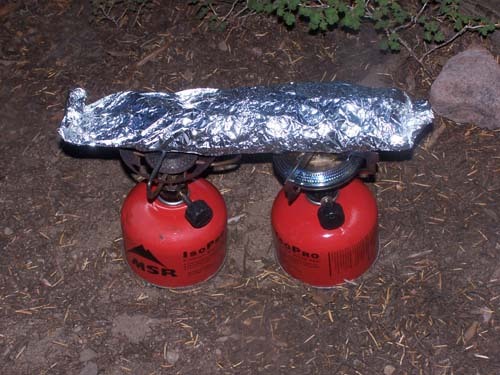 I caught him at dinner time so I went in and got him ready for the foil method of cooking trout in the High Sierras. 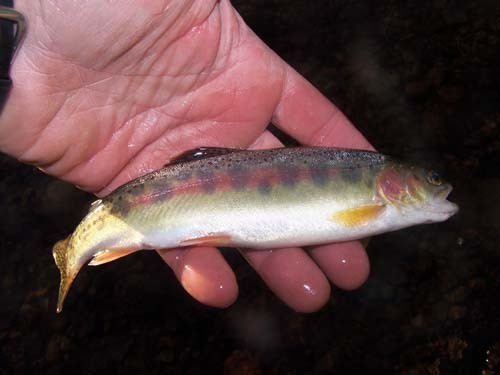 He made a very tasty meal and as I was sitting there in camp enjoying my solitude, eating my wild golden trout, caught on the fly rod I designed for this trip, I thought to myself dreams do come true, some just take longer than others. After dinner I went out on foot and casted on the shore in between gusts of wind. I caught a few more trout but they were small; some were golden’s some were cutthroats but they were all caught on a dry fly. I did not get much sleep on this trip the wind blew so hard that my tent flapped in the wind all night. Now I know what those climbers feel like when they camp at base camps with those high winds. The next morning I hit the shore early and caught many small Golden’s. After breakfast I went float tubing again but the wind, with those strong micro bursts made it challenging and extremely cold. In fact it got so cold that it started to snow. I decided that this was good enough for this trip and that I would come back next year. I packed up my gear and headed off. Once on the trail I experienced some strong winds. 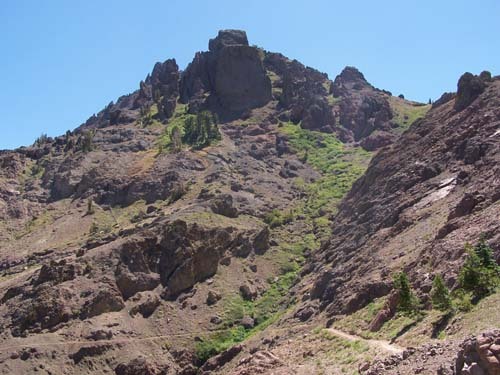 So strong that I was blown off the trail a few times and lost my hat several times. The trail was narrow and on the side of a canyon so I needed to be extra cautious. My scent and noises were being blown back by the wind and my presence was being cloaked. As is the case when the wind is blowing towards you; you are more likely to surprise animals you would normally announce your presence too before you arrive. All of a sudden I saw a Mountain Lion. 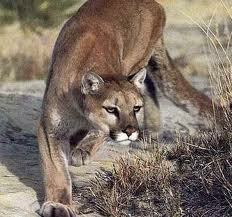 It was about 100 yards from me and after seeing me continued on its course down the canyon. What a relief! I made it back in a few hours to my car and after changing my flat tire made it back home in time for dinner, a shower and a nice warm bed without the wind.